This selfie stick is compatible with most devices (including cameras and smartphones of various models). You can either attach your phone to the phone holder or unscrew the phone holder, then attach your camera to it, as shown in the diagram below. 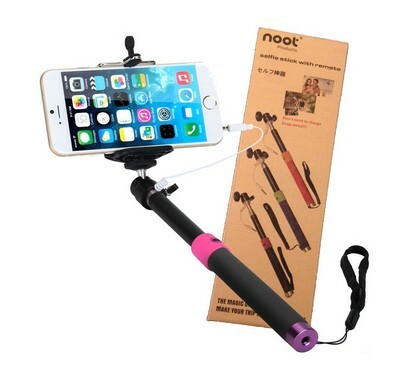 This selfie stick is compatible with various phone models such as iPhones (4S, 5, 5S, 6, 6+) and Androids (Samsung Galaxy 3,4,5 Samsung Note 2 and even other popular brands such as Sony, LG and more. This is because it apparently does not use the bluetooth feature, instead it functions by plugging the wire into the headphone jack of your phone. Having that said, you have to make sure that your phone will be able to fit into the provided extendable phone holder. In this case, you will have to make sure the width of your phone is in the range of 5.6 - 8.5cm. If not, your phone would not be able to fit perfectly. Precaution: There are some customers pointing out that this selfie stick does not work with large and heavy phones such as iPhone 6+ because the stick will bend a little when extended to it's full length even after tightening the screw. So, if you are using heavy phones, I would suggest going for those with better quality. Comfortable handle - Made of soft pad which makes it more comfortable besides making it less slippery. Extendable selfie stick - Allows you to extend the selfie stick to a maximum length of 95 cm (including the handle) for great selfies. When not in used, the extended part of the stick can be contracted so it can be brought around easily. 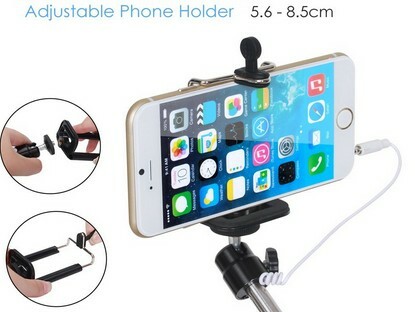 Rotatable phone holder - The phone holder that comes together with this selfie stick is rotatable to allow you to take selfies at various angles to picture yourself in the way you favor most. It also comes with a screw to allow you to tighten the position of the device. In-built Bluetooth System - This is a great feature that you wouldn't want to miss out when getting a selfie stick. You can now take selfies with just a click on the button on the stick without having the need to set timer. Safety String - There is a safety string connected to the handle of the product. This is great as it acts as an extra protection in case the selfie stick accidentally slips off from your hand. The quality control of this product isn't that good. There are quite a number of cases where the sticks broke in a few days or so. Although, this is normal as it happens in other products, I would consider that the durability of this product is low as many customers are facing the same issues. There are even customers complaining that the parts of the stick are glued (meaning to say the parts of the stick will detach any time). In some cases, the screw seems to malfunction causing the phone holder to be loose. About 30% of the customers (based on those who reviewed only) are having issues with the quality of the product. This product has an average rating of 3.8 stars in Amazon. The main reason for it's low rating in Amazon is due to the fact of it's poor durability. Having that said, there are still quite a number of customers who really enjoy the product and claim that the product works as advertised. Based on the customer's review and the product quality, I would say that the rating should resolve around 3.5 stars which is 7/10. The customer's support for this product is extremely great. They come back to you in no time (probably less than 2 hours) when you leave your review concerning the product in Amazon (of course only unsatisfied reviews). This is really fast, other brands often take up to more than a day to reply you. The best part is that they are willing to refund you 100% or send you a brand new selfie stick if you are unhappy with the original one you bought within a one-week guarantee period. The Selfie Stick worked as described, but unfortunately broke. This was a gift and the person who received it was very excited about it. The company was great about giving me a refund for the defective product. Would buy again because of the customer service I received. They do reply emails quickly (we personally tried emailing their customer's support team to check out on their speed) which improves customer's experience. We hardly rate products 10/10 especially in this aspect, but I have to say, the customer's support of this product is certainly flawless. This selfie stick comes in 3 different colors - Black, Blue, Orange. The colors come in pairs (i.e. 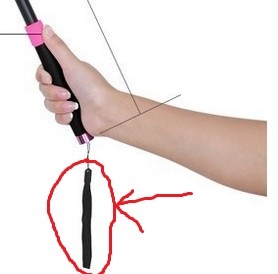 for black, the handle isn't black completely, instead having pink color around the top part of the handle). Let me show you some images for easier understanding. The problem is that I don't quite like the colors except for the one with black and pink handle. It seems that the color choices aren't that great though. 1) No pairing is needed. You do not need to pair the devices (the stick and your phone) before taking your selfies. This reduces the trouble and steps of pairing of devices. 2) No battery needed. No batteries are need for the selfie stick to work (unlike in other selfie sticks) because it apparently functions like a earphone button. In addition, the consumption of your phone's battery is greatly reduced due to the fact that you do not need to turn on the bluetooth function. The setback. Some customers complain that the manual does not provide enough information and guidelines needed to operate the selfie stick. In addition, it seems that the manual consists of broken English - however, still understandable. This product has a recommendation level of 3/5 (recommended). You may feel shock why the recommendation level isn't high although this product do have some awesome ratings for some aspects that we are considering. The reason is simply that the durability of the product is really low and has been posing problems to quite a number of customers. However, looking at the great customer's support (10/10) where they are willing to replace a new selfie stick or even refund you your money, I would say it is worth a try - especially if you are looking for a cheap and great selfie stick.